Reader of this blog, Ian, alerted me to an online source for pewter products including a few souvenir buildings you can order. Miniatures of The Halifax Town Clock and Peggy's Cove Lighthouse, both in Nova Scotia, Canada, can be purchased from Aitkens Pewter. They also have a ‘larger' Snug Cove Village with multiple buildings in this fishing village. The real Halifax Town Clock, also sometimes called the Old Town Clock or Citadel Clock Tower, is one of the most recognizable landmarks in the historic urban core of Halifax, Nova Scotia, Canada. The idea of a clock for the British Army and Royal Navy garrison at Halifax is credited to Prince Edward, Duke of Kent, who arranged for a turret clock to be manufactured before his return to England in 1800. It is said that Prince Edward, then commander-in-chief of all military forces in British North America, wished to resolve the tardiness of the local garrison. The clock tower is a three-tiered (three story , irregular octagon tower built atop a one story white clapboard building of classic Palladian proportions. It was erected on the east slope of Citadel Hill facing Barrack (now Brunswick) Street. The clock face is 4-sided displaying Roman numerals. As with most clocks the "4" is shown as IIII for aesthetic symmetry and not as IV. The Town Clock began keeping time for the garrison on October 20, 1803. The tower housing the Town Clock has been used in the past as a guardroom and as a residence for the clock caretaker. The caretaker position ceased in 1965 with its maintenance now being performed by Citadel Hill employees who wind the clock mechanism twice weekly. A major restoration project in 1960 saw the exterior façade of the Town Clock building returned to its original Georgian appearance. The real Peggy'sPoint Lighthouse, built in 1915, is one of Nova Scotia’s most well-known lighthouses and located in the quaint fishing village of Peggy’s Cove along the South Shore an hour from Halifax. Peggy’s Cove is famed for its picturesque and typically East-Coast profile, with houses perched along a narrow inlet and on wave-washed boulders facing the Atlantic. Although this unique environment has been designated a preservation area, it is still an active fishing community. I wrote about other pewter replicas here. Hi Dave. Nice item on two of Atlantic Canada's emblematic buildings. 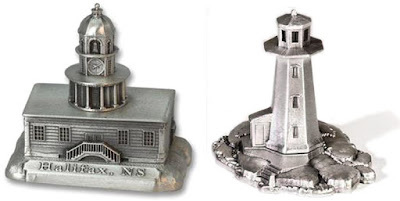 Thought your readers would like to know that the Peggy's Cove Lighthouse and the Halifax Town Clock are no longer featured on the "Miniatures" page of the Aitkens website. But if you use the site's search function you can find the order forms for both e.g. Using the search function you can also bring up another structure you didn't mention; the iconic "Three Sisters" gas lamp St. John, New Brunswick. While not a building per se, it's an historic landmark with an interesting story. HI Ian, Thanks for the additional information!